If you enjoyed drinking chocolate milk as a youngster, there’s a good chance you were consuming a Nesquik product. The 70-year-old brand is renowned for its kid-friendly chocolate powder. 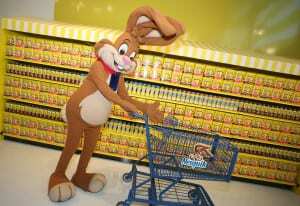 But over the years, Nesquik has evolved its range of offerings to stay relevant and cultivate new generations of loyal customers. 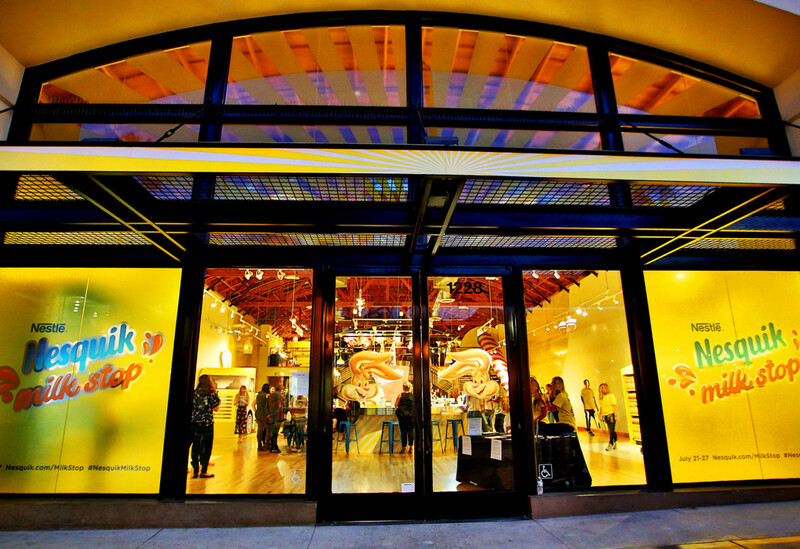 So to highlight its expanded portfolio while celebrating its roots, the brand activated a weeklong anniversary pop-up experience dubbed the Nesquik Milk Stop. 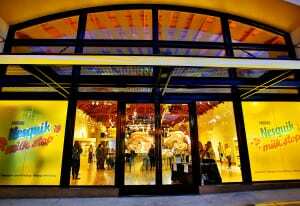 Rich with Instagrammable moments and sweet treats, the experience served as Nesquik’s first full-fledged foray into experiential marketing. Following a media preview earlier in the week, consumers could stop by Santa Monica’s Third Street Promenade from July 21-27 to take a nostalgic trip back in time through Nesquik’s history while simultaneously exploring its updated range of products. A key element of the Milk Stop experience was Nesquik’s partnership with Jordan Andino, a restaurateur and celebrity chef whose childhood love of Nesquik products has never waivered (the brand calls the phenomenon the “bunny cycle”). 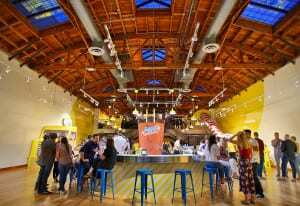 In addition to hosting the pop-up’s media preview, Andino concocted two original Nesquik-based beverages: the Candied Bacon Milkshake and Berry Banana Smoothie. 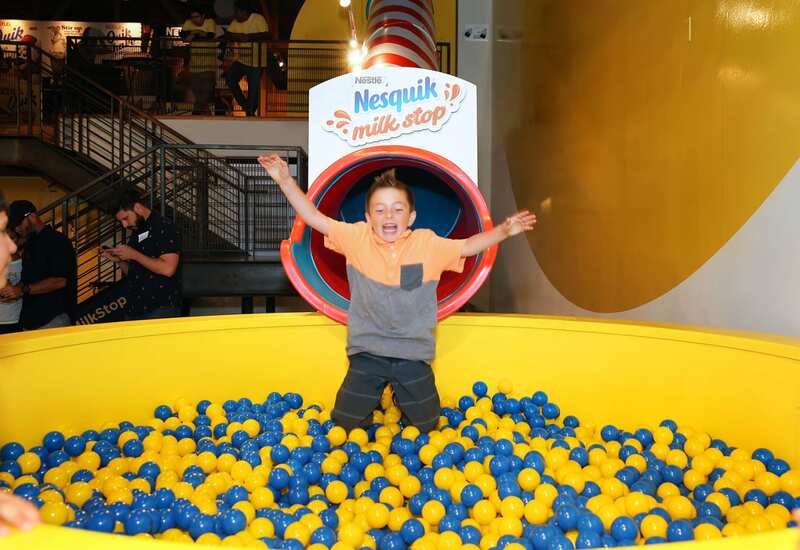 Both beverages were available throughout the activation at the milk bar (Nesquik products were literally on tap) which served as the focal point of the experience and a place for attendees to sip back and relax. 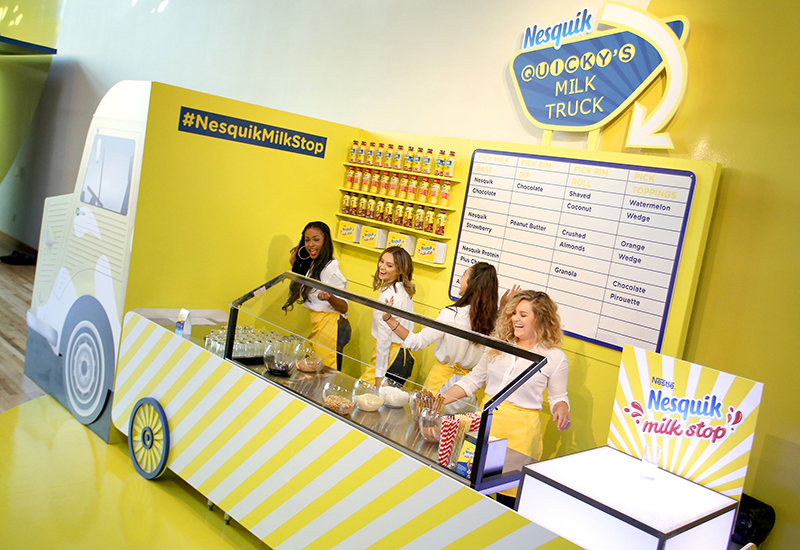 Over at Quicky’s Milk Truck (a reference to the brand’s mascot, Quicky the bunny, who interacted with attendees at the media preview), consumers could sample Nesquik’s ready-to-drink products or create custom “mega milk” creations. The custom beverages started with a base of chocolate or strawberry milk, or for those with lactose sensitivities, chocolate powder that could be mixed with almond milk. From there, attendees could coat the rim of the beverage with ingredients like crushed almonds, shaved coconut and peanut butter, then add toppings ranging from watermelon wedges to peanut butter and jelly skewers. When their concoction was complete, consumers could place the beverage on a designated up-lit box designed for snapping and social sharing. 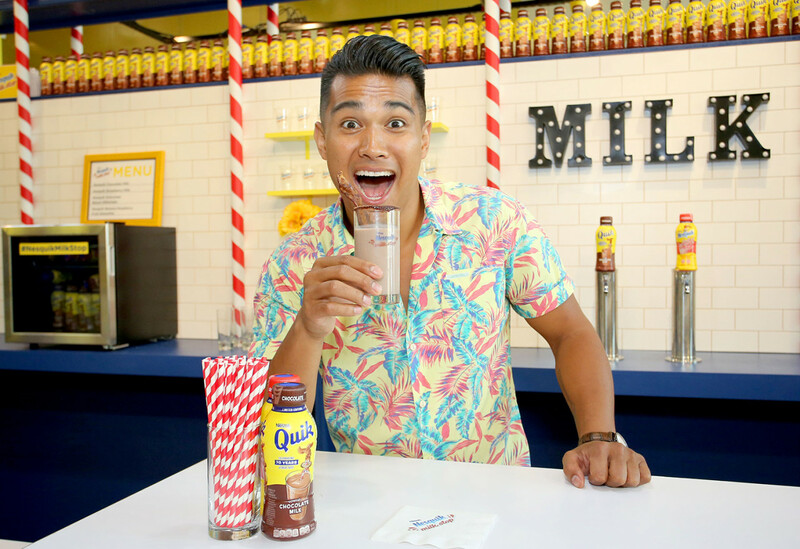 At Quicky’s Milk Truck, consumers could sample Nesquik’s ready-to-drink products or create custom “mega milk” creations. Of course, the photo ops didn’t stop there. 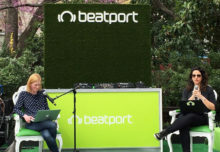 Attendees could stand on a surface designed to look like a splash of regular milk against a backdrop of chocolate, vanilla and strawberry raindrops falling from clouds as they posed with branded umbrellas. 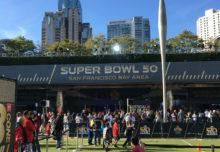 There was also a photo backdrop designed to mimic a grocery store aisle featuring wall-to-wall Nesquik products and a branded shopping cart, which was frequently shared across social media during the weeklong experience, according to the brand. And then there was the undeniable fan favorite—a two-story straw slide that led to a ball pit featuring the brand’s signature blue and yellow color scheme (sign us up!). 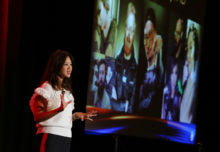 Rounding out the experience was an upper-level Throwback Lounge designed to extend attendee dwell time. In addition to a vibrant yellow motif, the space included a wall papered in nostalgic Nesquik ads, retro décor and plenty of places to kick back and relax. “Whenever our consumers talk to us about Nesquik, their whole face lights up—it’s the yellow, it’s the bunny,” says Jackie Jimenez, marketing manager at Nesquik. 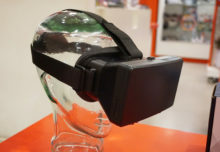 “It’s a nostalgic brand, but we’re trying to infuse much more meaning into that. We can’t just be a nostalgic brand. So it’s how can we be a meaningful brand that’s still rooted in amazing memories and great times, and evolve and mature it?” Agency: Mosaic, Chicago.